Replace the fan shroud and motor assembly as a unit. Do not replace cooling fan motor or cooling fan blade separately. Partially drain engine coolant from the radiator. Refer to CO-12, "Changing Engine Coolant". 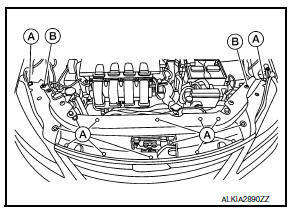 Remove the radiator core support upper cover clips (A) and screws (B), and remove. Remove the hood lock assembly from radiator core support (upper). Refer to DLK-154, "HOOD LOCK CONTROL : Removal and Installation". Remove the radiator core support (upper) bolts, then remove the radiator core support (upper). Refer to CO-15, "Exploded View". Disconnect filler neck hose from radiator and radiator hose (upper) from water inlet. Remove filler neck screws from fan shroud and motor assembly, then remove filler neck with attached hoses. Remove reservoir tank and reservoir tank hose. Disconnect fan shroud and motor assembly harness connector. Remove fan shroud and motor assembly. After installation refill engine coolant and check for leaks. Refer to CO-12, "Changing Engine Coolant" and CO-11, "System Inspection". Fan shroud and motor assembly is controlled by ECM. Refer to EC-63, "On Board Diagnosis Function".